In the latest of several similar incidents, police detained four women from the Women of the Wall activist organisation at the Western Wall plaza Sunday morning for wearing prayer shawls. The women were questioned for more than two hours and then brought to the Jerusalem Magistrate’s Court, where they were served with a restraining order forbidding them from entering the Western Wall plaza for 50 days. This law is interpreted to include women performing religious practices at the Western Wall traditionally done by men in Orthodox Jewish practice, such as reading from a Torah scroll, wearing tefillin or a tallit, or blowing a shofar. Approximately 50 women from the organization assembled in the women’s section of the plaza Sunday morning for the prayer service for the new month, many of whom wore prayer shawls, or tallitot, traditionally worn by men. The four women who were detained were wearing black and white or plain white tallitot, whereas the rest of the group were wearing more colorful prayer shawls. The police generally tolerate the wearing of the decorative tallitot by women, and only take exception to women wearing the black and white, blue and white or completely white shawls, which they view as being the preserve of male worshipers. Lorraine Skupsky, 62, was one of the women detained and banned from the Western Wall plaza. 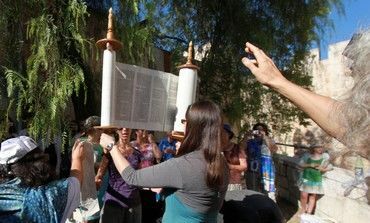 “It is disgraceful and reprehensible, and it was abhorrent that women are denied equality in front of the Western Wall,” said Skupsky, who immigrated to Israel last December. “It is totally disrespectful and denigrating to women to be treated in this unequal manner in the Jewish state,” she added. Jerusalem police spokesman Shmuel Ben-Ruby said police requested several times that the four women who were wearing “men’s” tallitot remove them. When they refused, the four were detained. In previous instances, women received restraining orders of a week or 10 days plus a fine if they broke the restraining order. Ben-Ruby said the severity of the restraining order shows that the courts see the issue “in the same level of severity” as the police. “It is not a law, it is a decision from 2003, the decision of the High Court of Justice is that the women must behave according to the customs of the site,” said Ben-Ruby. “The customs say men with tallit, women without tallit. It is like a women putting on tefillin,” he said. Ben-Ruby explained that the police will not detain women who are not wearing a multicolored “women’s” tallit, draped around the neck. They will only detain women who wear their tallit “like a man,” referring to the more traditional black and white or blue and white prayer shawls worn folded around the shoulders. In a similar incident in June, a woman praying with the Women of the Wall was detained and banned from the site for seven days for wearing a black and white tallit, and another three women were briefly held, also for wearing “male-style” prayer shawls. Anat Hoffman, the chairwoman of Women of the Wall, denied that the frequent incidents are designed to provoke media attention, despite being aware of the legal issues, saying instead that the law is unjust. “When Rosa Parks rode on the front of the bus it was illegal,” Hoffman pointed out, referring to the famous civil rights activist in the US who protested the practice of segregation in the American south. “But in fact it does matter where you sit. And similarly, no-one should be telling women to take off their tallit. “This is a struggle to liberate the Western Wall from the dictates of a small group of fanatic extremists which has taken over the site,” Hoffman said, adding that efforts until now to change the law through legislation in the Knesset have failed. “Instead of uniting with the holiness of the place, we are forced to be witnesses every month to an extremist political struggle of an extremist and provocative group, which wants to harm the holiness of the site and the feelings of the worshipers. Reprinted article by Jeremy Sharon, with permission from www.jpost.com.